Ask the Expert…How does Mold Affect My Health? Mold usually isn’t a problem for most people. Everyone has mold spores in their home. However, when the spores find a wet, damp, or even moist area, they begin to grow very quickly. When they start growing in your home, health hazards start affecting your family and even your pets. The most common health reactions to mold are Allergic Reactions. It affects both people who are allergic to mold and those who are not. Along with allergic reactions, microbial growth can cause asthma attacks, allergy responses like sneezing, runny nose, skin rashes, and red or irritated eyes. For immune system compromised individuals, it can cause severe respiratory distress. This list isn’t complete and research is ongoing on the effects of indoor mold and health. 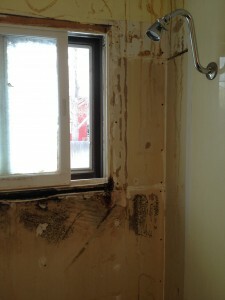 The best way to recover from the symptoms caused by mold, is to remediate it. The image above is underneath a sink that was subject to a leak. The homeowner wasn’t quite sure whether or not he could tackle the remediation himself without calling a professional for help. Scroll down to find another image with the Homeowner’s decision. 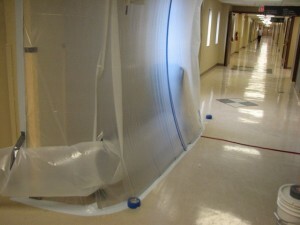 Here are a few techniques from epa.gov for minimal (meaning under 10 square feet of area) mold remediation. ARS advises even for small areas, to call us so we can help you determine what you need to take care of the problem. Before working in the affected area, wear respiratory protection! 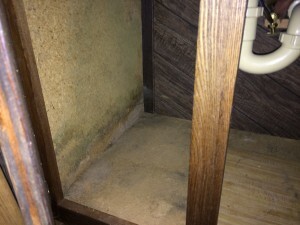 The tips and techniques presented in this section will help you clean up your mold problem. Professional cleaners or remediators may use methods not covered in this publication. Please note that microbial growth may cause staining and cosmetic damage. It may not be possible to clean an item so that its original appearance is restored. Absorbent or porous materials, such as ceiling tiles and carpet, may have to be thrown away if they become moldy. Mold can grow on or fill in the empty spaces and crevices of porous materials, so it may be difficult or impossible to remove completely. 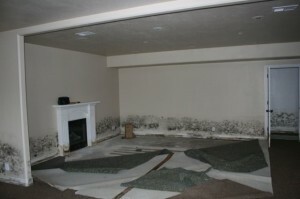 ARS Flood & Fire Cleanup offers free or discounted Mold Scopes and remediation estimates! So before you try and tackle the problem on your own and potentially make it worse, call a Disaster Specialist to have them scope the affected area and they will be able to give you an idea of what you are looking at for the remediation. ARS Flood & Fire Cleanup also works very closely with a 3rd Party Industrial Hygienist who can test your home for microbial growth. This comes in great handy if you suspect mold, but cannot find it. They are able to test inside and outside your home to learn what spores you have, and what spores could be a concern to your family’s health. This image is what ARS found when the homeowner did decide to call for help. 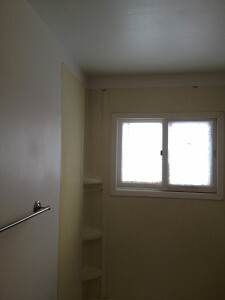 The growth was extensive and hiding in between paneling and sheetrock. Needless to say, the homeowner had more than he planned on and asked ARS to remediate the problem for him! Ask an Expert. . . What are the Do’s and Don’ts of Carpet Cleaning? Carpet Cleaning should be on your Spring Cleaning List and here’s why: if carpet is not cleaned and cared for regularly and correctly, it can become a health issue. Do-Have your Carpet Cleaned Professionally. Don’t-wait too long in between cleanings. Why is carpet cleaning so important? Besides keeping your home clean, it could greatly impact your families health! Do you have children or pets who frequently play on your carpet? They are especially susceptible to contaminates found in the fibers of your carpet including dirt and food along with other pollutants. These pollutants make way for bacteria and microbes to move in your home with you and your family and they hide deep within your carpet. On top of being unsanitary, the dirt and other debris collected in carpet can act like sand paper to carpet fibers. When this happens, the life of your carpet is lowered and you will start to see more severe traffic patterns in the areas most walked on. All of this can be avoided with regular professional carpet cleanings. It seems like, to be cost effective, we would consider using a rented carpet cleaner or home carpet cleaner and clean our carpets ourselves. 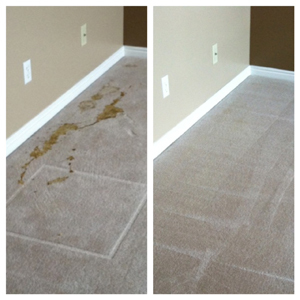 However, the home and rented versions simply don’t pack the punch a commercial grade carpet cleaning system offers. Along with that, most homeowners have never been trained to properly clean carpets. It is an art, a science, and an acquired skill—and it’s a process that needs to be done just right to protect your carpet and your home. Even the wrong concentration of chemical or the wrong kind of chemical will leave your carpets filling dirtier than before and attract more dirt, faster. Don’t- use a discount Carpet Cleaner or a “cheap cleaner.” You get what you pay for. If you don’t pay for much, your carpets will show it. Another scenario to avoid is “cheap cleaners.” Cheap carpet cleaning services might save a homeowner money initially, but could possibly cost you more money down the road by having to call in another company to come clean your carpets or worse, the cost of having to replace carpet. An untrained technician will not have the knowledge needed to properly mix chemical, where to use what kind of chemical, or how to treat difficult stains leaving your carpets worse off. They can also over saturate your carpets or not block up furniture correctly leaving them susceptible to warping or rotting. The biggest problem across the industry with “cheap cleaners” is their inconsistent quality of service—you never know what you are getting. Do- call ARS for carpet and upholstery cleaning! ARS takes great care in training and following industry standards and protocol when it comes to carpet cleaning. We also employ the use of commercial grade equipment and cleaning solutions to penetrate deep into the carpet and remove dirt and debris along with treating stains. We can also treat your carpet with protective substances that block future soiling making your carpet look cleaner longer. Stains can be super tricky! Don’t make a stain even worse by guessing how to clean it up! Let ARS clean it for you! Ask the Expert. . . Oh great, I have a Flood! Now what? Chances are, once in your lifetime (or more if you live near an area prone to flooding), you will experience a flood in your home or workplace. Disasters are bad enough, but when they are in your home, stress levels can go through the roof. It’s hard to believe, but other than being cropped, this image has not been altered to show more water! This is an example of a large water loss in which the structure was subject to a water main break. This particular flood was so large, multiple ARS locations were called to handle the mitigation. While it’s a short wait between the time you call ARS and the time a Disaster Team is at your door, it can feel like an eternity due to the state of panic you might feel from the flood, but stay busy, it helps! 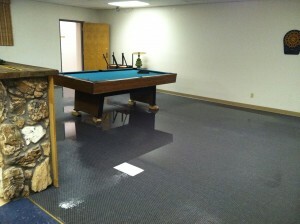 Look closely and you will see standing water covering the entire floor! This image is an example of ground water and how it can quickly take over when it pushes it’s way through a structure’s foundation. First, if you haven’t already, call ARS. Sometimes, we want to try and save money by calling a friend or handyman to help you mitigate the water. Keep in mind, ARS is a Certified Firm by the IICRC (the people who literally wrote the book on disaster cleanup and sets and maintains industry standards for restoration companies) and ARS is insured to help better protect your home. Our Disaster Cleanup Team also ensures your house or structure is drying correctly to prevent the growth of any mold. Friends and Handymen are wonderful, but can’t protect and restore your home like ARS can and don’t always have the right equipment to find moisture, mitigate the damage, dry out the structure, and restore your property to its pre-loss conditions. When carpet is not dried correctly, it become susceptible to microbial growth. This picture is an example of carpet effected by a flood that was not correctly dried out after the water loss. Second, call your insurance and see what they need from you to start a claim*. Any and all medical necessities, i.e., eye glasses or contacts, prescriptions, hearing aids, and anything else you might need. If any of these items have been effected by a sewage flood, take caution before handling them and alert ARS beforehand you need for any of those items to not be bagged up. Remember, we are open 24/7, 365 days a year to assist you with a Flood! So don’t stress, call anytime day or night and an ARS representative will be available to take your call and dispatch a team to your home to prevent further damage! *Not all water losses are covered by insurance. You may be responsible for the cost of the cleanup. With that being said, ARS is happy to work with you on the cost of cleanup and restoration as a courtesy to you! This list is for informational purposes only. Homeowner is responsible for removing all personal belongings both listed and not listed. ARS is not responsible for lost or damaged property. Ask the Expert…Do I Need to Worry About Spring Flooding? In the Northwestern States, we grudgingly accept the fact that we get late snowstorms postponing the April Showers and May Flowers. With that being said, spring is *almost* here. A couple more hard-hitting snow storms and we can start pulling out the shorts and flip-flops. Before you reach for the sunscreen, read on to protect your home from Spring Flooding. Check for standing water around your home’s foundation. If you find standing water around your foundation on the outside of your home, use landscaping materials to create a slope that gradually directs water away from your home and into your yard. Seal any leaks in your roof, windows, walls, or foundation. Moisture can lead to mold and weaken the structure and integrity of your home. 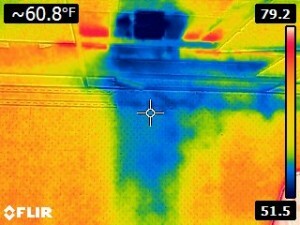 If you see a wet spot and are unable to locate the source of the leak, ARS uses thermal imaging cameras to help locate moisture, hot and cold spots, and other potential hazards hiding in walls, ceilings, and floors. Take a look at this Thermal Image. The area in blue is where moisture is hiding in the walls and ceilings and is not apparent to the naked eye. Check all sump pump pits, crawl spaces, basements, and cracks in your foundation to ensure they are dry. If you find moisture, call ARS as soon as possible to check for damage and help you determine if a sump pump or French Draining is needed or to start monitoring the ground water underneath your home. If you already have a sump pump, ensure it is working and it has a power source other than electricity in the event of a power failure. Also check to make sure when the sump pump turns on, it does not flip your circuit breaker or GFI. Install a moisture alarm in or near the pit in case the sump pump fails. Below is a video of ground water bubbling in through the foundation. When ground water is higher than the bottom of your foundation, the water is going to try and force its way into your house. If detected early, the amount of damage it causes to your home is substantially less than if it goes undetected. Safely check your drains, gutters, and downspouts for debris, clogs, or holes. Ensure water is running away from your house. Use downspout extenders to send water into your home rather than next to your home. Shovel snow and ice away from your home. Even though this isn’t a complete list, being proactive about Spring Cleaning and ensuring your house is ready for Spring Flooding can save you from lots of stress, a big mess, and lots of $$$ down the road! If you have any questions on spring flooding or floods in general, call your local ARS and speak with the Water Damage Experts. We’re here to help! Ask the Expert. . . Where in my home is the most prone to fire? 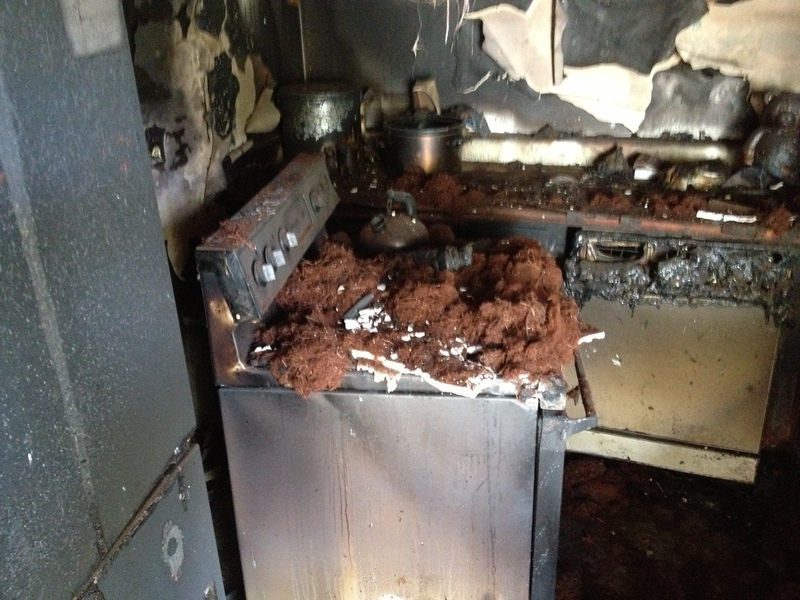 Did you know that kitchen fires are the leading cause in household fires? One minute you’re frying up a pan of Grandma’s Famous Fried Chicken, the next you are searching for the Fire Extinguisher to douse a grease fire. After the fire is put out, you no longer have eyebrows, your kitchen is destroyed, your whole house is blanketed in smoke, and to top off the night—you’re eating fried chicken endorsed by a colonel in white outfit in a sketchy motel because the Fire Department deemed your house unsafe. How can you avoid a Kitchen Fire? -To start with, avoid cooking if you are sleepy or have consumed alcohol. If you are a bit drowsy, set a timer or two to turn your stovetop or oven off or use a microwave and cook food for short intervals. -Don’t leave the kitchen while you are cooking if you can avoid it. Especially when frying, broiling, grilling, or boiling food. It only take a few seconds for a great meal to catch fire. -When cooking with oil, always stay in the kitchen. Heat cooking oils slowly and use cooking specific thermometers to gauge the temperature of the oil. Add ingredients slowly and carefully to the pan to avoid splatter. Keep a lid close to the pan whenever cooking with oil. Watch whatever you are cooking closely; if you see or smell smoke, immediately turn off the burner and/or remove the pot or pan from the heat source carefully. Smoke is a sign the oil is too hot and can ignite. -Check food you are cooking regularly, ensure that it is not charring or the pot you are cooking with has cooked off all the liquid and is burning the pot or remaining ingredients. -Be careful with clothing, oven mitts, kitchen towels, paper towels, trash or anything flammable near the stovetop or in the oven as paper and synthetic materials are extremely flammable. – Fire Extinguishers are also a great tool and you should be kept in your kitchen, but can spread the grease all over your kitchen and make an unnecessary mess for small grease fires. Think of a Chemical Fire Extinguisher as your last resort because it can contaminate your entire kitchen. – Before you reach for the red canister, try to smother a small grease fire by sliding a lid or cookie sheet over the pot or pan and turn off the heat source. Allow the pot or pan to cool completely before handling it again as the fire can restart or cause the handler serious burns. Alternatively, salt or baking soda can be used to smother grease fires as well, but only on small fires. Do not use flour or other cooking ingredients as they do not have the same effect as salt or baking soda. *NEVER USE WATER TO EXTINGUISH A GREASE FIRE* Water can cause the grease to splatter and be an extreme danger to all those around and can be damaging to your home. -If at any point you are not comfortable or able to safely contain the fire, evacuate your home and call the Fire Department at 911 when outside your home. 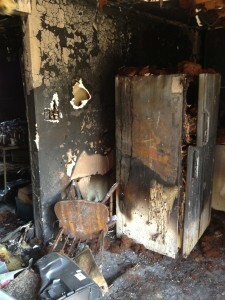 -In the event you do have a kitchen fire, call ARS to help you Cleanup, Rebuild, and Restore your home. 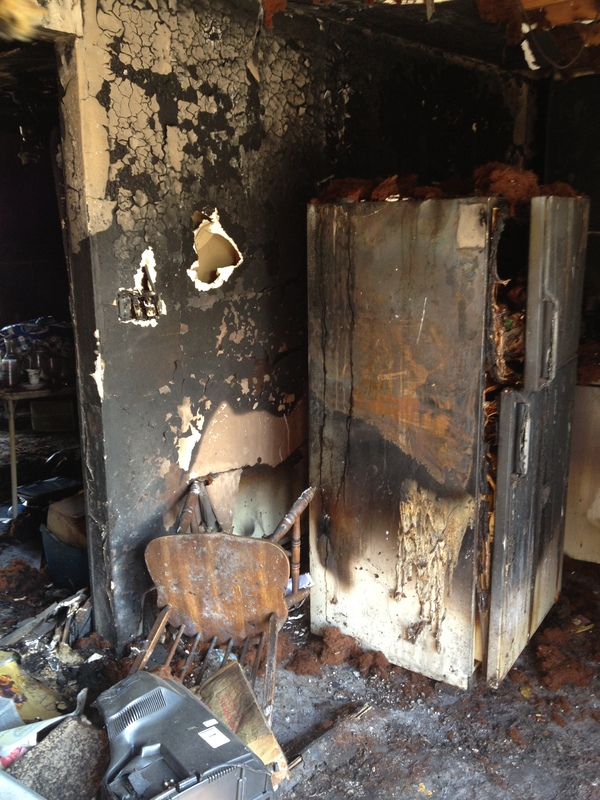 We are able to effectively remove and remediate fire and smoke damage. If any area is unable to be salvaged, ARS is able to help you rebuild your home as licensed General Contractors. Ask the Expert. . . What can I do to Prepare before a Disaster? How do you really prepare for the worst? Is it even possible to cover all your bases in the event of a disaster? What can I do to Prepare before a Disaster? Realistically, it’s hard to prepare for the worst possible outcome in various scenarios, but there are measures you can take to help you recover from the event smoother and faster. Below is a list of 7 helpful tips to help you get through a disaster at your home or business. Go through your home and take pictures of each room, closet, garage, and other spaces. If you had to start completely over in each room, what would it cost to replace the contents in each space? Make a list of the major contents and what it would cost to replace each of the items at current market value. Keep the pictures and records on a thumb drive away from your home or store them on a safe cloud based web server along with a copy of your Insurance Policy. Keep all very important files and documents such as Birth Certificates, Social Security Cards, or Insurance Policy Information in a fire safe container or in a safety deposit box. At least once a year, meet with your Homeowners Insurance Provider or Agent to adjust your policy, add new property, check your limits, adjust your deductible, and see if you qualify for discounts. Be sure to include any items that fall under insurance exclusions like jewelry, luxury items, or firearms. During this meeting, discuss the cost of adding a Back-up of Sewer and Drain Policy. While most insurances cover certain types of water damage, most do not cover sewer or water backup. This is a great add on if you live in an area susceptible to flooding or are serviced by a City Sewer Line. We recommend a minimum of at least $10,000 in flood and/or sewer coverage. Routinely check your home for leaky pipes, mold spots, standing water inside or outside, add downspout extenders to your gutters, check for old or faulty electrical connections, remove trash or clutter, ensure your home’s street number is visible from the street to better help Law Enforcement and Emergency Responders find your home in the event of emergency, clean your dryer lint screen regularly, turn your water main off before leaving for an extended period of time, test you sump pump before rain storms to ensure it’s working and set up a moisture alarm near the sump pump in case it fails, check all around your home for pests and block them from coming in your house, keep a fire extinguisher on hand, and ensure all smoke detectors have fresh batteries and are in working condition. Have an emergency fund available. Make sure it includes enough cash to pay your insurance deductible and extra to provide for short term living cost. If you don’t have a fund, start by automatically putting a little bit of money aside after each payday into a savings account. It will add up quickly! Plan for the worst, if your water supply is cut off or contaminated, do you have enough bottled water for your family and pets for a few days? Are you able to cook or prepare food if your utilities are disconnected? Do you have a 72 hour kit for each family member if needed? Will you have light in your home without electricity? Again, start our slowly if you are not prepared in all these areas. Work on an area of preparedness a week or even a month until you are confident you have enough to provide for your family. At minimum, keep a basic first aid kit handy and brush up on your first aid skills! This list is not complete or comprehensive, but it definitely gets you thinking and the wheels turning. We cannot always avoid disaster, but it gives great peace during a stressful situation being able to care for yourself and your loved ones. Ask the Expert… Why can’t I use Bleach to Cleanup Mold? When you smell bleach, what’s the first thing you think of? Normally, the scent of Bleach gives us the assurance that whatever we are cleaning, is indeed getting cleaned and disinfected. It’s a go to cleaner and even given out after disasters by the gallons to home and business owners for the assistance of helping with the cleanup—especially after a major flood. Take a look at the picture on the left. It shows a little-teensy bit of mold at the top of the shower. It’s almost hard to see. Now you grab the bleach cleaner, spray it on the shower, and wipe it down and you’re done. Great. That mess is taken care of, right? Bleach’s active ingredient is Sodium Hypochlorite and it is highly effective in removing any discoloration. In regards to mold, it may bleach out the discoloration caused by mold growth, but it leaves behind the microflora (the roots of mold) that will start to regrow overtime leaving you with another mold spot. Think of it of having your hair bleached, after it’s been done it looks nice, but in a few months, you’ll have roots that grow out and need to be bleached again. Another ingredient in Bleach is water. 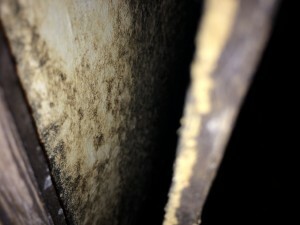 Water is a food source for mold. So, pouring bleach on mold gives it a new look, a new smell, and a big meal that will make it want to come back even more because of your great hospitality. Along with giving it a free meal, pouring liquid on mold can cause sporulation, meaning the mold wants to stay at your house and sends out little seeds to the rest of your house. Have you ever blown the seeds off of a dandelion? Think of mold and liquid the same way—the seeds go everywhere. Here’s a picture of the same bathroom from above without the shower insert. Mold has spread all behind the shower and into the building material leaving a giant, unhealthy, expensive mess that bleach won’t cleanup. In order to eliminate the mold and prevent future mold growth, you need to contain and eliminate it completely, rather than just cleaning the surface with Bleach. This is where it gets technical. Killing mold requires a very specific Biocide Cleaner. On top of that, industry standard recommends physically removing mold contamination. Because everyone reacts differently to mold spores and the gases it gives off differently, ARS takes great care in remediating mold. 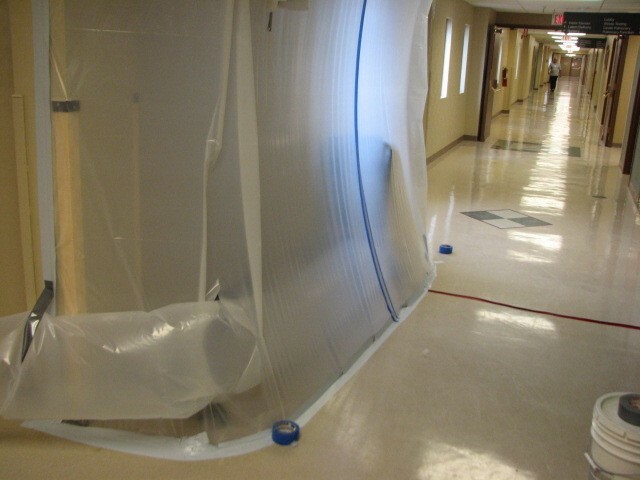 ARS Mold Technicians build a containment area, they wear protective clothing and respirators, and use special HEPA Vacuums and Air Scrubbers to ensure mold isn’t spread into other areas. So, before you grab your bottle of Bleach Cleanup to spray an area affected with mold, consider giving ARS a call to check it out before it takes over the whole house. Ask the Expert. 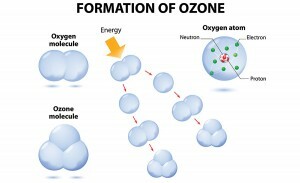 . . What is Ozone? How does an Ozone Generator remove odor from my home? First off, let’s figure out what Ozone is. . .
Ozone is a colorless gas with a pungent odor and powerful oxidizing properties, formed from oxygen by electrical discharges or ultraviolet light. 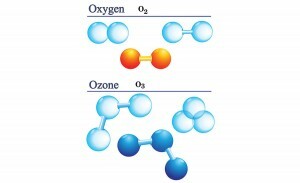 It differs from normal oxygen (O2) in having three atoms in its molecule (O3). Ozone is a naturally occurring element found on Earth and is created when an electrical arc like lightning or certain ultraviolet rays from the sun are introduced to oxygen in the atmosphere. 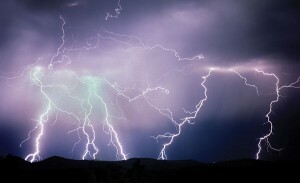 When a strong electrical current, like a bolt of lightning occurs, oxygen molecules are ripped apart leaving single oxygen atoms to hang out— the oxygen atoms hate being single, so they quickly pair up with other oxygen molecules and create O3. The Ozone layer in the atmosphere is created by the sun’s shortwave ultraviolet rays rather than electricity through a similar process. Ozone Generators replicate either the electrical or ultraviolet process on a much smaller scale in order to work in your home. I bet you are thinking, this is all fine and great, but how does an Ozone Generator remove odor from my home? Simply put, the oxidation process changes the odor molecule to a new compound and it can no longer hold the odor. Spray on deodorizers trap the odor, whereas Ozone Generators change the molecular make-up of the odor completely. Ozone Generators are especially effective in removing smoke smells from homes, cars, and other enclosed areas. Ozone Generators are typically used after any restoration work is completed and are safe to use in homes. It’s required for safety to not enter the room or premises while the Ozone Generator is in use and making sure pets and plants are also not in the room while it is running as it removes the oxygen from the air. After the room airs out, it is safe to be in and the odor is eliminated. Ask the Expert … How often should I clean my carpets? Misconception #1: Wait as long as possible before cleaning your carpet. Dirt is an abrasive, like sandpaper. Every time you step on your carpet, dirt is ground into the carpet and cuts the carpet fibers. A dirty carpet will not last as long as a clean carpet. Vacuuming helps, but by itself, it is simply not enough. A good test to see how much your vacuum is actually picking up is to vacuum a throw rug then take it outside and shake it. You will see how much dirt and dust will still come out of the rug, even though it was just vacuumed. The longer you wait to have your carpet cleaned, the more damage is done to your carpet and the faster it wears out. Misconception #2: The only reason to clean my carpet is to remove the dirt, so if I can’t see the dirt, it doesn’t need to be cleaned. Outdoor air contains pollen, fungus, bacteria, air pollution, cigarette smoke, car exhaust and hundreds of other chemicals. When you enter your home, you carry this pollen , bacteria, and chemicals on your hair, skin, clothing and shoes. Not surprisingly, all those chemicals and toxins wind up in your carpet. If you have allergies, asthma, emphysema, or other breathing problems, one major source of the problems could be the pollens, fungus, smoke, and chemicals in your carpet. 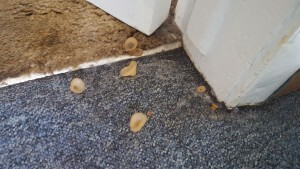 This should be a good reason to get your carpets cleaned sooner rather than later. Just think, if you only “vacuumed” the stains out of your clothes instead of washing them in hot water- the clothes would never come clean. In answer to the question, it is recommended to get your carpets cleaned every 6-12 months depending on the “traffic” in the home, i.e. the number of occupants and pets. At ARS we use a truck-mounted hot water extraction system called a Vortex (the type of cleaning recommended by the leading carpet manufacturers Shaw and Mohawk) a system guaranteed to give your carpets the best cleaning ever. How can I know if the damage to my home from water is covered by my homeowners insurance? When water damage happens to a home, panic mode sets in with how it is going to be cleaned up and how the cleanup and restoration will be paid for. Homeowner insurance policies differ from company to company in coverage, monthly payment, and deductible. This makes it difficult sometimes to advise someone what it will cost them out of pocket or if and what the insurance company will cover. In the event of water damage, always call your insurance agent to verify any insurance coverage. We are happy to work with all insurance companies on claims you may need to make.